Good tasting, reasonably healthy chip from a brand I trust and respect. The cheddar ones are impossible to stop eating though, so good! Feels like you are eating a very hearty chip. This chip stands up to any dip...won't break. Definitely a bit of a nutty flavor as well. I feel healthy when i am eating them. I wish there were more coupons available for this product. These chips have such a great crunch. Flavor is earthy and nutritious with a sprinkle of sea salt. 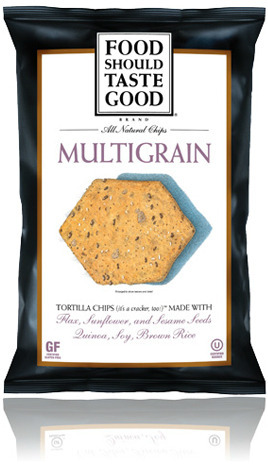 You can see all the great grains in each chip. The young kids and husband fought over who was going to "hold" the bag. Next time, we will need to try the chips with dips and hummus.